In the First World War and for the first time in the history of man, nations combined to fight against nations using the crude weapons of those days. The Second World War involved every continent on the globe and men turned to science for new devices of warfare which reached an unparalleled peak in their capacity for destruction. 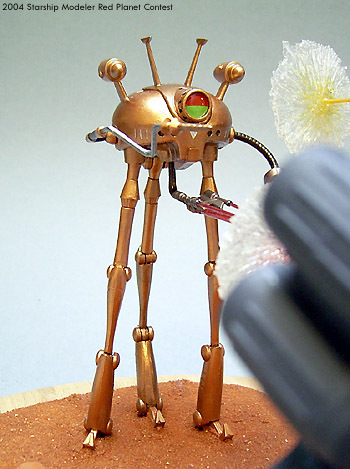 In the middle of the 20th century, fought with the terrible weapons of super science, menacing all mankind and every creature on Earth, the War of the Worlds against the evil martian invaders has taken place. No weapon was effective against the martian war machines. Their armor was impenetrable. Mobile units, in tripodal mechs, divided every country like a fresh made pie. One by one, all countries, first, second and third world, descended into chaos and anarchy. But on the eve of the sixth day, as uniformly as they had welcomed themselves to their new home, the invaders succumbed to the simplest illness: a common cold. Their research and sampling efforts had overlooked a modest rhinovirus. They were as innoculated against disease as any army could be, and had conducted biological evaluations through countless probes and abductions over hundreds of years. But unprotected against one insignificant mutation of staph, they fell as one. In the years that followed, mankind rebuilt a new world order. Cynical minds had always suspected that the cultural cleaning of a nuclear holocaust might have been beneficial. Here, men found that they could have that and not suffer the horrible consequences of a wrecked world in the process. To be sure, the infrastructure of the planet was devestated. But if there was one facet of mankind where the invaders had underestimated their quarry, it was his determination not only to survive, but to dominate his world, his universe. 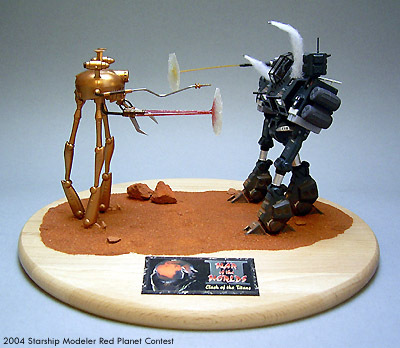 I used two mech-models for that diorama. One is an Ideon Dog-Mack purchased a few weeks ago from Ebay, the other one is nameless since I own this one since the 1980ties and can`t remember how it was called. I took it completely apart and totally rebuild and repainted it, added some additional bits and repaired the evil scratched canopy with Future floor wax. I painted it with a dark Navy grey as the basecolor with details in various shades of grey and black. Finally I added some paint chips, scratches and small damaged areas so that it looks like it has been built in hurry - earth needed many of them as fast as possible to be able to attack the Red Planet before the martians were going to start a second try! 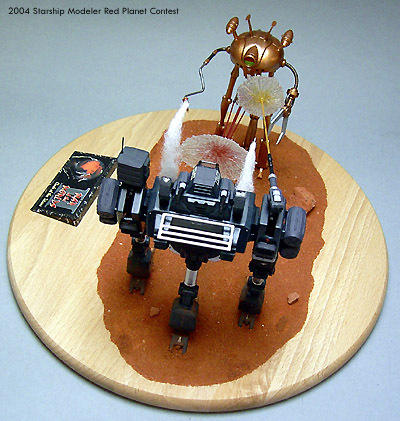 For the Dog-Mack, which looked very Martian to me, I used only metallic colors: Copper, bronze and tin biz mainly, all from Citadel / Games Workshop. Details are done with chainmail, silver and black. I altered the bottom of that model while adding a heatray canon on a tentacle instead of the huge thruster nozzle that comes with the kit. Very subtle weathering and aging has been done with light grey and silver. I wanted to show real fighting action going on with that diorama, so I tried something I never did before (and I never saw before on other models): Making an invisible shield partially visible when being hit! So the heatrays are done with acrylic rods, painted with clear colors from Revell. I`ve done this a bit thick and irregular so that they look like beams of flickering energy instead like clean and sharp lasers. The areas in which the energy is deflected by shields are made from water effect, a jelly like stuff that is normally used for model railroads, a bit drybrushed with the same color like the hitting ray. For that purpose I sculpted the shields in thin layers on an acrylic sphere, pulling them off at the end, glueing them onto the rods of the beams with clear epoxy glue. The use of three beams for the martian ray weapon is a tribute to the weight of the attached shield, I planned to use only two beams, but that way the gravity sag has been much too strong. The contrails from the launched missiles are made from cotton wool, wraped around acrylic rods with one millimeter diameter. The tips of those rods are sticking out a bit, sanded in shape and painted with Bolt Gun Metal to represent the warheads. The base is wooden, partially covered with a few rocks and red sand. That stuff, glued upon a slightly sculpted surface made from putty, is real red desert sand from a nearby petshop, usually needed for small lizards. 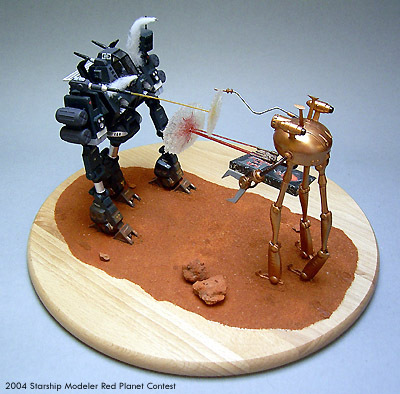 I pressed the mechs into the still wet sand / glue mix to create some footprints of their walking path. 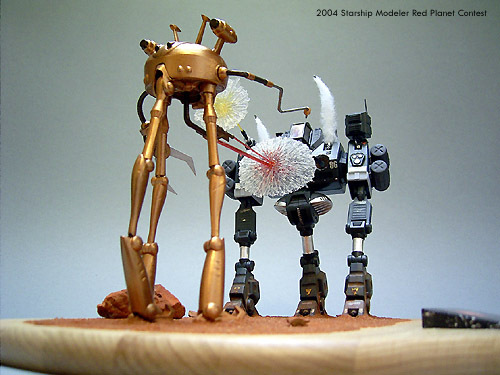 At the end I formed small bulwarks out of a mix from sand and white glue around the feet of the two mechs so that it looks like they sink a bit into the dusty ground because of their tremendous size and weight. 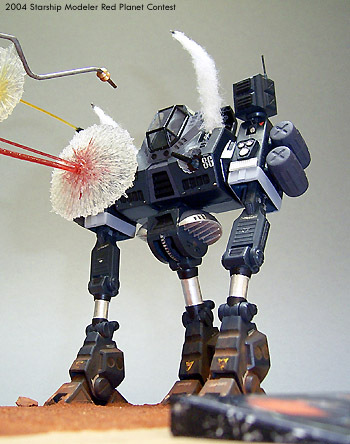 Finally the feet has been dusted with red pastel chalk to simulate the effect of producing dustclouds while walking, leaving red marks on the lower areas of the war machines. 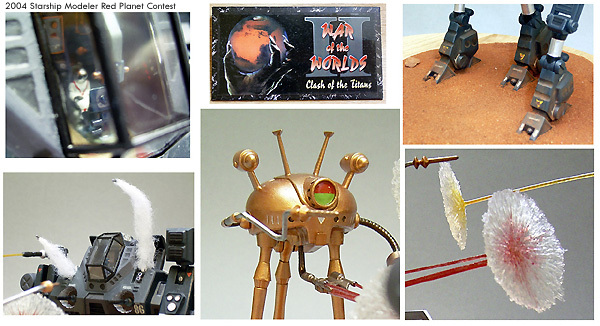 The selfmade nameplate, created from cardboard and clear adhesive film, shows Mars clutched by a clawlike human hand and the term War of the Worlds II: Clash of the Titans.